Fuel-efficiency standards are a way of preventing car companies from being forced to hedge their bets by working on gas guzzlers as well as efficient runabouts. As a result, those companies can take the money they’d otherwise spend on developing six-ton monsters, and invest it instead in the efficient cars of the future. Everybody wins, and the cost — contra Porter — is negligible. He’s absolutely right that higher gas taxes are a very good idea. But that’s no reason at all not to implement higher fuel-economy standards as well. Felix has written a 2 page editorial complete with color charts without considering the curious question of why Ford sells so many inefficient SUVs. He says "everybody wins", except that is, the people who currently choose to buy Ford Explorers over Ford Fiestas. These people will be prevented by law from using their own money to buy the car they want. Felix could make all sorts of arguments about the benefits of the Fiesta, but he can't argue the facts, that many Americans weigh this same decision and believe the Explorer is better for them. Why is Felix in a better position to judge what car they should drive? How is limiting his fellow citizen's choices a "win"? Felix commits the classic Progressive mistake of confusing his own preferences for that of all his countrymen. Perhaps his next editorial can suggest that every car should be blue- then companies wouldn't have to bother with all those different paint colors! Everybody Wins! The only folks more prone to rants than myself are Tesla fans talking about neural nets. So I thought, why not combine the power of the rants? I'll rant about Tesla fans ranting about the power of neural nets! To get myself good and wound up, I listened to a recent Tesla Daily Podcast about Full Self Driving (FSD) and Neural Nets. Go ahead, listen to it. I'll wait. It's actually not that bad. "Jimmy D" is the guest and he talks with some authority about neural nets. He doesn't get anything terribly wrong on the basic tech. Everything he says about how Tesla plans to exploit it seemed reasonable to me. If you are a Tesla skeptic, it's a good way to understand Tesla bull thinking. I've written down my predictions for the upcoming Tesla autonomy event. Writing these things down helps codify your thinking. Making it public helps keep you honest. Right or wrong, I'll learn something important come April 22rd. No features will be tied to HW 3.0.They announce the HW3.0 switch over- probably starting in Q3. [Updated 4/7, H/T @ElmerFUDD] - it appears they may already be making some cars with HW3. Perhaps the 4/22 date gives them 3 weeks to clear out older cars before announcing the new HW?The game will be to announce L2 features and pretend like L4/L5 equivalents are coming soon.We will not see the legal disclosures. 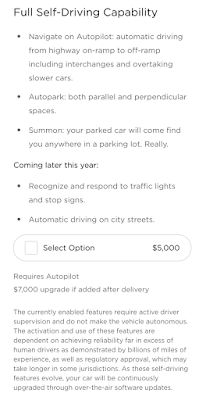 Elon will largely promise the world, but when things launch all liability will be on drivers.Tesla Network is back, but in the vaguest possible way.They will demo something every AV could do 4 years ago, except it's not reliable enough to actually do L4/L5. If you're a Tesla bear and haven't read Bad Blood, well stop reading this and go get yourself a copy. It's a great read, but I suspect in a year or two when "Disorder of Magnitude- The Elon Musk Story" (h/t @ElonBachman) comes out it'll make Theranos seem like Sesame Street. In the wake of the SEC & 35K announcement many bears think the end is nigh. I'm skeptical of that, but it's a good time to clarify my thoughts and put down my guesses as to what's really going on at Tesla. Hopefully in a year or two, we can look back and see how accurate or wildly inaccurate my inferences were. I should add that my track record here on what's going with Tesla is not great, but you only hit the pitches you swing at. 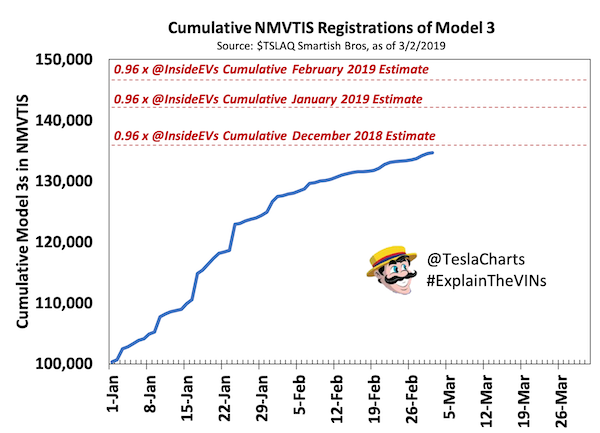 In this, the first of two posts, I'll explain the "VIN Gap", what it means, and why I think Tesla has acted as it has.